This Dolce & Gabbana Miss Marylou Doctors Bag is a grey leather doctors style handbag with gold coloured hardware throughout. 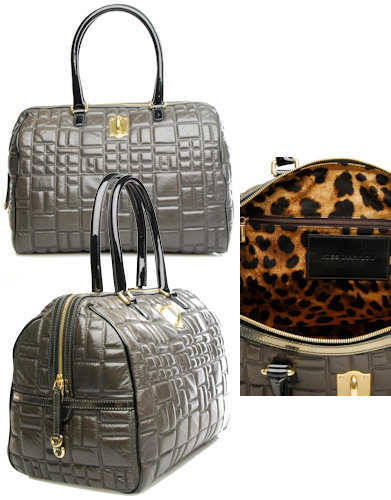 The bag has all over quilted squares of different sizes and is lined in a signature leopard print fabric. The bag has a zip top fastening and features two top enamel handles in black. There is a Dolce & Gabbana metal plate on the front of the bag. Inside, there is one zip pocket, one slip pocket and a leather brand label. Measurements: 38cm / 14.8″ x 21cm / 8.2″ x 28cm / 10.9″ ; all measurements are approximate. Emminently stylish and classic in design, this timeless Dolce & Gabbana hand bag is the epitome of style for the modern woman. Ladylike and easy to carry, this would make a great bag for use on or off duty and the grey colour goes with everything.